A large survey on the vector of Xylella fastidiosa, the spittlebug Philaenus spumarius, has been conducted over the 2 past years in Corsica by the research team of INRA Montpellier, partner of XF-ACTORS. More than 2500 specimens have been sampled with 448 screened for the presence of the bacterium. 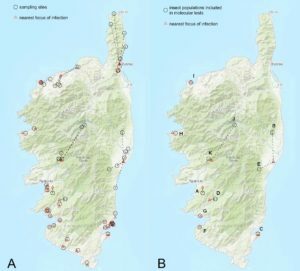 The results of the survey are included in the paper “Using insects to detect, monitor and predict the distribution of Xylella fastidiosa: a case study in Corsica”. The research team of INRA Montpellier (France) has recently published the results of a large survey for P. spumarius conducted over the past 2 years in Corsica (France). 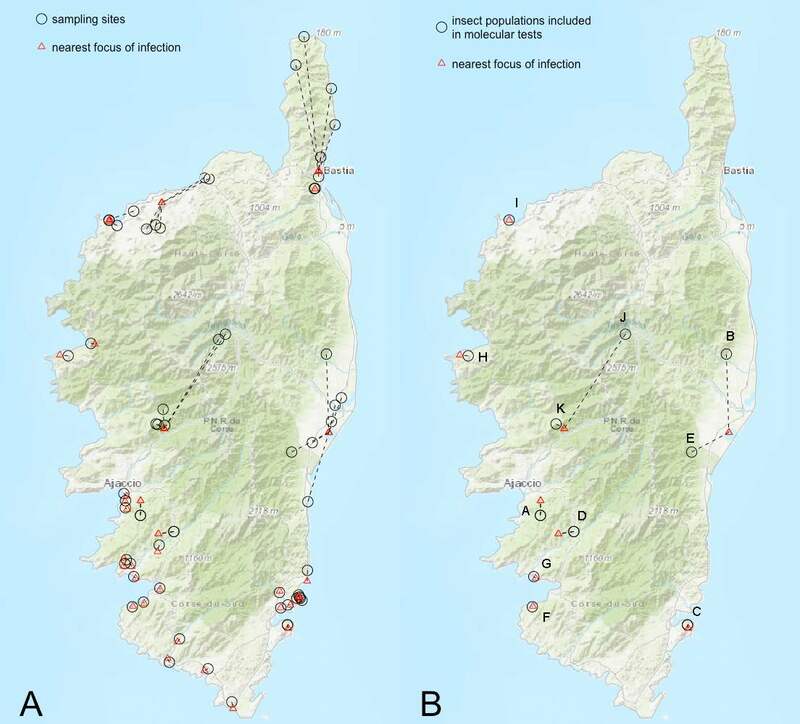 Over 60 different populations of Philaenus spumarius (Ps) were collected throughout Corsica and screened for the presence of Xylella fastidiosa using qPCR (Harper et al., 2010) and a custom nested PCR. The results show that the qPCR assay, commonly adopted to detect the bacterium in the insect specimens, has a lower sensitivity than the newly developed nested-PCR test. This new test was combined with the MLST-approach for typing the strain(s) detected in the insects. 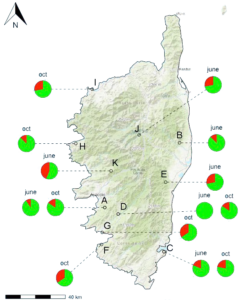 The results showed that different strains/subspecies of Xylella fastidiosa are widely distributed in Corsica, suggesting old introduction(s). In Corsica, the predominant host plant for spittlebugs is different from what previously reported in other areas (i.e. Southern Italy), indicating that the knowledge on the biology and ecology of the vector species, under different conditions, is essential for implementing an effective management strategy for reducing the vector populations and the spread of the bacterial infections. Indeed, this study points out the possibility of using insects as spies to predict and better assess the exact distribution of Xf in a target area. 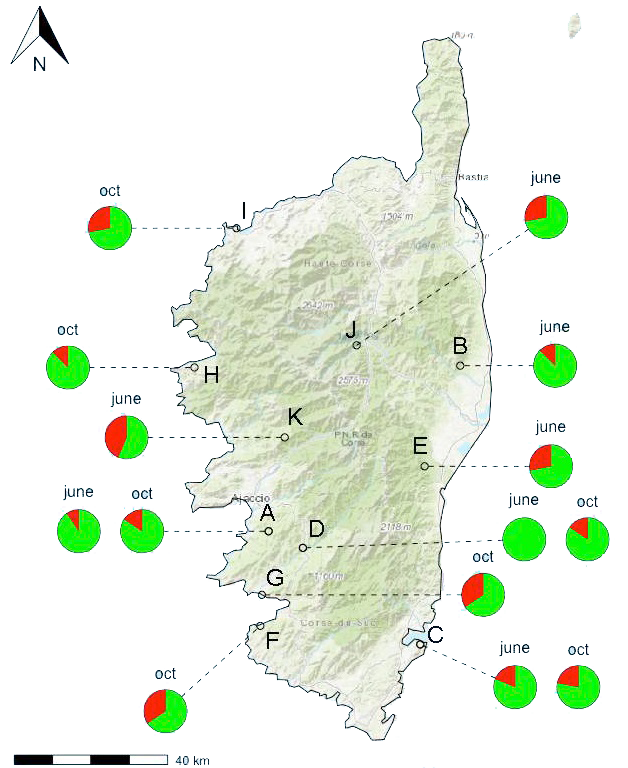 The results of the survey are included in the paper: “Using insects to detect, monitor and predict the distribution of Xylella fastidiosa: a case study in Corsica”, which is available for free download on the website of XF-ACTORS project.